Duncan Little Theatre's "Beauty and the Beast" comes to The Simmons Center's Jack A. Maurer Convention Center stage on Feb 19,20, 21 and 26, 27th, 2016. 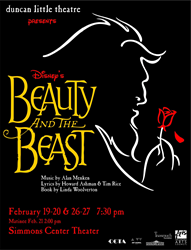 Duncan Little Theatre presents "Beauty and the Beast"
DLT’s outstanding production of the year “Disney’s Beauty and the Beast” is the classic story of Belle, a young woman in a provincial town, and the Beast, who is really a young prince trapped under the spell of an enchantress. If the Beast can learn to love and be loved, the curse will end and he will be transformed to his former self. But time is running out. If the Beast does not learn his lesson soon, he and his household will be doomed for all eternity. A charming musical with beautiful music and spectacular sets for all audiences that is not to be missed. Performances are at the Simmons Center Theatre at 7:30 pm each night on February 19,20, 26 & 27th. A matinee at 2:00 pm will be on February 21 . Box office opens at 6:30 pm and tickets are $20 adults, $15 Seniors, Military, Students. Tickets are also available at the Simmons Center's Jack A Maurer Convention Center office between 8 am-4:30 pm Monday through Friday. For more information contact http://www.duncanlittletheatre.com or 800-782-7167 for general inquiries.